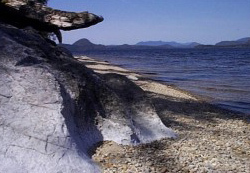 Kennedy Lake Provincial Park is a popular day-use destination for lake and beach-based recreation. This park is comprised of two sites along the south shore of Kennedy Lake, adjacent to Pacific Rim National Park Reserve on the west coast of Vancouver Island. Visitors come to swim, kayak, fish and windsurf at this beautiful park, where in the fall it is possible to view beach spawning of sockeye. Black bears are frequent visitors at this time. Due to the steep-sided mountains surrounding Kennedy Lake, the largest body of fresh water on Vancouver Island, winds whip up across the main part of the lake and Clayoquot Arm with little warning, requiring extreme caution by paddlers and boaters. Facilities at this day-use only park include a small picnic area, pit toilets and a small rustic boat launch suitable for car tops only. Special Features: A number of small creeks under the highway offer spawning and rearing habitat for several species of fish. In the fall it is possible to view beach spawning of sockeye. Black bears are common at this time. Bring your own drinking water as potable water is not available in the park. All surface water must be boiled, filtered or treated prior to consumption. Campfires are not allowed in this park. Kennedy Lake is located adjacent to Clayoquot Sound on the west coast of Vancouver Island. This park is comprised of two sites along the south shore of Kennedy Lake, adjacent to Pacific Rim National Park Reserve. The park is located on Hwy 4, 8 km east of the Pacific Rim Hwy/Hwy 4 junction. Nearby communities include Tofino and Ucluelet. Cultural Heritage - This area has been inhabited for thousands of years by the Nuu-chah-nulth First Nation. In the 1900s, settlers came to the area and fishing and logging became viable industries. Today, tourism is strong, encompassing wildlife viewing, sports fishing, kayaking, wilderness camping and other activities. The connection of the Nuu-chah-nulth peoples to this land is a vital, driving force, and it is equally important for visitors to respect this connection. Approved Purpose Statement and Zoning Plan [PDF] for Kennedy Lake Provincial Park is available online in pdf format. Visitors can canoe or kayak on Kennedy Lake. Paddlers should be aware of prevailing westerly winds, which generally pick up in the afternoon during the summer. There are opportunities for fresh water fishing on Kennedy Lake, which is known to contain Cutthroat trout. Fishing is permitted as per provincial and federal fishing regulations. All anglers should check the current regulations issued by Fisheries and Oceans Canada prior to fishing. Anyone fishing or angling in British Columbia must have an appropriate licence. There is no designated swimming area at this park however the sandy shores of Kennedy Lake offer good swimming opportunities. There are no lifeguards on duty at provincial parks. Visitors can windsurf on Kennedy Lake, however be aware the winds can whip up across the main part of the lake and Clayoquot Arm with little warning, requiring extreme caution by paddlers and boaters. There is a small rustic boat launch at this park, suitable for car tops only, that is on a small gravelled pull out off highway 4, and is adjacent to Log Dump Creek. This park has a day-use/picnic area with two picnic tables, 1 wheelchair accessible pit toilet, parking lot and boat launch. These facilities are located adjacent to Log Dump Creek. This park has 1 pit toilet, located near the parking lot and boat launch. Picnic tables and the pit toilet are wheelchair accessible.